Apart from their normal day-to-day occupations the people of the River Ver valley have over the years had many trades and specialities. The evidence of some of these still exists. Of particular note are activities needing supplies of pure clean water – milling, malting, brewing, paper making, straw and rush work, and, not least, watercress production. Milling is covered elsewhere. Malting and brewing as well as needing pure water for the processing also need good quality barley produced by light soil and a not-too-wet climate – as in the Ver Valley – so successful was the 18th century brewing industry in the area that surplus yeast was ‘exported’ to London as cattle-feed. Paper making needed mills to pulp the cloth, which the River Ver had many, and for a while they were mostly turned over to paper making. But the 19th century saw the growth of the straw industry in the area, with the chalk soil giving hollow long-stemmed wheat which was pliable and perfect for plaiting. Dealers would buy the standing corn, thresh, rake and sort it, and sell it at market to the women who would provide cheap labour to split and plait it. “There are women that will earn five shillings a day” commented educationalist Arthur Young in 1804. By 1882 St. Albans had 40 straw hat manufacturers employing over 1100 people. Sadly by the end of the century the Hertfordshire straw had been replaced by cheaper lighter Chinese and Japanese plait, but the skill is not totally lost as corn dollies are still exported from the area. 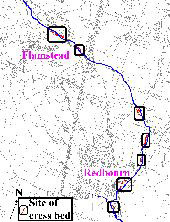 Redbourn grew up around its cress industry which started above Friars Wash, near Flamstead, in 1885. There was then a “great flow of water”, with a depth of 12 feet at Do-Little Mill. The cress was originally grown directly in the river bed, but later special cress beds were built using the water from nearby springs and artesian wells sunk to tap the groundwater. 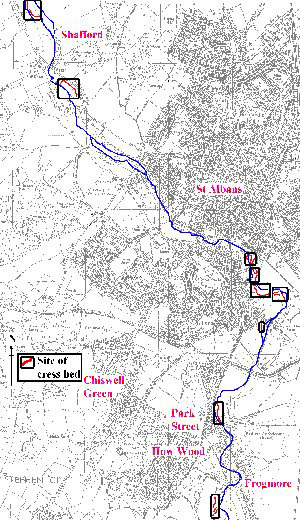 When the cress beds around Redbournbury fell into disuse in common with all the others along the river the area reverted to water meadows but the indentations formed by the former cress beds can still be seen along the valley. Watercress, now growing wild, chokes those parts which still have a little water even lower down the river, where the flow used to be so swift it could not gain a foothold.